Dainess (pronouced Di-ness) is a 14 year old girl. Dainess has been with us at Appleseed since we first began on Saturdays in an old cinder block frame. We don't yet have a lot of information about her family background except that she lives with her older sister and her children. We have been told that she is a 'vulnerable child' and not an orphan. This often means that the parents can not care for her, so another relative is doing so. Dainess is at the age when many Zambian girls drop out of school. 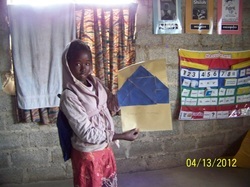 She had never attended school before coming to Appleseed in 2011 and has made good progress considering her late start. There was a time a few months ago that she stopped attending. When we sent our outreach worker to check on the family, he was told that she was going to another school in the compound. These schools generally have 70 to 80 kids in a class and no supplies or books for the children to learn from. In addition, they do not feed the children at all. After about a week, we had heard from her friends that Dainess was crying everyday because she wanted to come back to Appleseed. We do not know why the big sister wanted her at the Basic government school, but, again we sent Vincent, our outreach worker, to talk with her sister. We told her that we were looking for a sponsor for Dainess and encouraged her to allow Dainess to return to where her friends are and where she is thriving. The sister agreed and Dainess has been at school every day since then. It is so important for us to stay focused on her and the other girls of her age. In my estimation, these are the most vulnerable to the negative influences around them. Dainess is so happy to know that she has a sponsor who cares about her. She had a wonderful time on her trip to the mall and is very excited to be getting her new uniform, which she will get at the beginning of the next term, in May.